<-- Side note: Did anyone else think that was Alec on the front cover at first glance ? Okay, I'm going to review this one real quick for you. In City of Glass; Jace broods, Clary acts reckless, Simon is dragged around, and Magnus sparkles. Stuff happens, twist and turns to a resounding mediocre end. 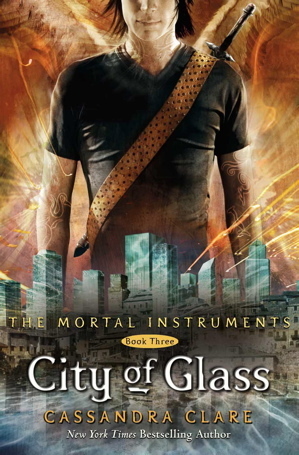 This book was less City of Glass and more like City of Glass plunged into my eyes. 3 stars. Okay, just kidding. While I don't love The Mortal Instruments , I love making fun of it. Reading this book is like watching TV, it's entertaining, keep me reading , but it is nothing really special. It almost felt like a filler episode while I wait for something greater to happen. I mean I certainly appreciate Cassie Clare's writing for keeping me intersted, she certainly knows how to pull you in. Heck, I even waited in a 2 hour line for her to sign this book. This book shows a progression of the series and Clare's writing; purple prose is virtually nonexsistent, we have a more focused story line that is fast-paced. While reading,I hoped Alec would have stepped up more in this book. He just acted like a wet blanket. I wanted him to get all BAMF on the demons and it never really happened except--when he has his moments with Magnus. Clare was tries to keep us interested by coming up with plot twist and turns, but many were predictable if you paid close enough attention.The story lines get too complex at times and the characters spend a lot of time catching each other up. I finished this book for Bout of Books, so I'm pretty darn proud of that. I read the whole thing in two days. No more Mortal Instruments for me. . .or so I thought. Now, this epic cliffhanger people are talking about has peaked my interest enough that yes, I am going to gravitate to the used book store and scavenge until I find City of Fallen Angels. “Have you tried talking to her?" I'm with you Simon ! For some reason this series frustrates me. I honestly thinks its because I dislike the character of Jace, I mean I feel bad for him (really who wouldn't ?) , but he is insufferable and doesn't really evolve. I immeditatly dismiss anything he says Seriously, when I was looking up quotes from City of Glass and saw quotes from Jace's proclomations of love to Clary I had no recolecttion of reading them because his insufferable personality is all that I really remember. In case you don't know Jamie Campbell Bower is playing Jace in the City of Bones movie. JCB is a pretty legit actor, so it will be interesting to see his interpretation of Jace. Straight up: I enjoyed the first three books of this series a lot, but that fourth one...NO. It truly feels ridiculous to put her characters through all sorts of crap again just for Clare to get some extra $$$ in her pockets. I would probably do the same in her shoes, lol, but as a reader it's just too much. I much, much prefer her Infernal Devices series. So, in conclusion, I wouldn't read CoFA if I were you because it's sooo much worse than this one.